Materials related to the condition of Chicago's water supply before the lake tunnel and crib. This illustrated page from the 1869 Annual Report of the Board of Public Works shows the 1853 Pumping Works at the foot of Chicago Avenue facing Pine Street (today's Michigan Avenue.) Construction began during the summer of 1852; the building and its tower were completed by the following year. The City itself constructed its first pumping station at Chicago Avenue and the lake, and the water to supply the pumps was drawn from an inlet basin at the foot of Chicago Avenue, the basin being separated from the lake by a semi-circular breakwater with an opening to the southeast. The distance from this intake to the mouth of the Chicago River was 3,000 feet. It was thought that water drawn through an inlet located at this distance from the mouth of the river would be free from contamination. However, the rapid growth of the City which followed soon after the opening of the Chicago Avenue station, the introduction of a sewerage system emptying into the river, and the establishment of the packing and other industries, resulting in the production of large quantities of industrial wastes, greatly increased the amount of filth discharged into the lake by way of the river, and this contamination, carried northward by the winds and lake currents, affected the water at the Chicago Avenue intake to such an extent that it soon became apparent that some other source of supply must be secured. Note: during the decade of 1850-1860, Chicago's population more than tripled from 30,000 to 100,000. Courtesy of the Illinois Regional Archives Depository (IRAD) at Northeastern Illinois University. 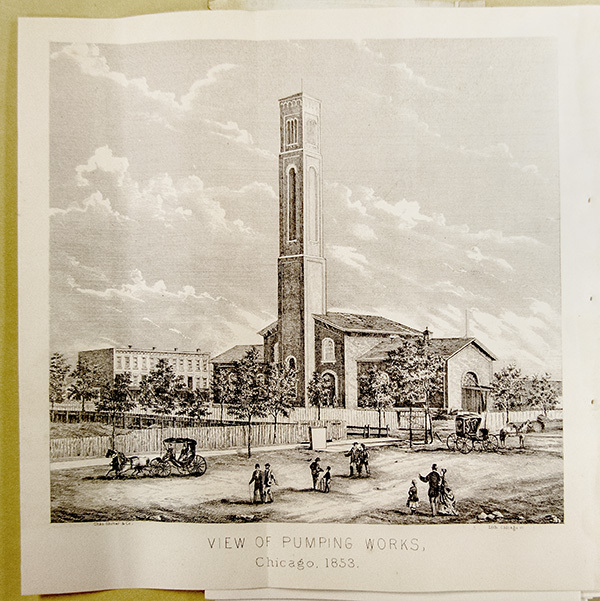 1854: Chicago Avenue Water Works put into operation, in February. It consisted of one reservoir with a capacity of about half a million gallons and eight and three-quarters miles of iron pipes. The water was obtained from the lake through a 3O-inch wooden pipe extending about 600 feet out into the lake to a wooden crib, and conveyed to a pump well under the engine house. The engine pumped the water into the mains and into the reservoir in the south division, located at Adams and Clark Streets. The dimensions of the old building, pump-well, and foundations would not admit the erection of additional machinery, and it became necessary to provie both a new engine foundation and pump-well. This involved the gradual taking down of the old building and the erection of new and commodious ones. After much discussion and great labor, which kept the city magnates in a perpetual frenzy, and burnt more gas than was necessary, this course was decided upon, and the preliminary work of removing the north boiler and smoke chimney, also a part of the wall of the main building, was commenced on March 19, 1866. The New Building handsome and substantial, was completed in 1869, and surmounted with that disastrous roof which, like the wrath of Achilles, brought so many woes upon the citizens, and caused the death of many persons. Everyone is familiar with the splendid edifice which, in appearance, was unharmed by the fire, and which is now receiving the first installment of its iron roof.